3. Flagging off male and female only. It was supposed to be flagging off according to categories. 5. Registration fees to expensive. Personal note: If this is how they organised an event, for sure for their November event Bukit Shahbandar Challenge, nobody will be interested in joining with their expensive registration fees, disorganised registration booth, etc. It was expected to be 1200 participants but only around 341 participants according to anakbrunei. I guess, Bruneians and overseas participants already learnt from their previous partcipations in 1st and 2nd Brunei Marathon that if the event registration fees is excessively high and with too much publisity - for sure the event gonna turn out bad. Event bertaraf kampong are more organised and way more cheaper. They should have learnt from the kampong organiser how to successfully organised an event. 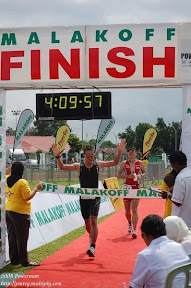 Advice ---> Learnt from other organiser mistakes, not from your own mistakes (by which you have made a mistake). Hopefully by next november event, it will be properly organised. The key word - START NOW NOT ONE MONTH BEFORE THE EVENT. Kalau kan memalukan Brunei lagi sekali in the eye of international participants for the 4th time (1st, 2nd Brunei Marathon and Tasek Climbathon), i would say no need to organise the november event. Buat konsert kah, charity event kah, food fair kah, etc - Brunei event organiser are very good at that but not at sport event.